Your weapons of choice to protect your fuel supply from the cold. That’s right! for the low low price of $15, you can help keep your snow blower, chainsaw, tractor, generator, snowmobile, ATV, UTV, log splitter, or anything else with an engine running smoothly through the winter months. For that price, you can’t afford not to! Seriously though, you should pick up fuel stabilizer and start using it as soon as you see frost on the ground. Since I have equipment that runs on both gasoline and diesel, I pick up a bottle of additive for both types of fuel. Why should you buy this kind of stuff? I’m glad you asked! 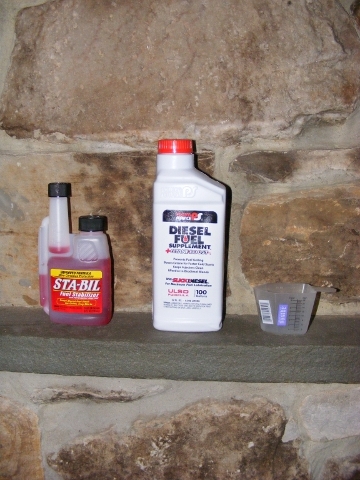 Diesel fuel can gel at low temperature! As the air temperature drops, diesel fuel undergoes a pretty common phenomenon. Basically the fuel is made of straight and branched chain hydrocarbons, aka parrafin. Yep, that’s wax. Depending on the source of the fuel, that wax can start solidifying at different temperatures, typically around 0°F. When the fuel drops down to these temperatures, it will start to turn cloudy, then it will solidify. This is known as gelling. It can happen in your tank, your fuel lines, your fuel filter, or your injectors! Basically it means your machine is down until the temperature goes back up! This can be combated with a simple additive such as the one in the picture above. You can buy these at auto supply stores, Tractor Supply, and some hardware stores. As I write this, I have a $7.79 bottle sitting in my shop that will treat 100 gallons of fuel. All I do is follow the mixing proportions on the back of the bottle and use a measuring cup and funnel to add the stabilizer to my empty cans before I head out to buy more fuel. Gasoline with ethanol attracts water! E10 is a typical blend of gasoline you get at a pump. It contains 10% Ethanol by volume. On the upside, it adds oxygen to your fuel, promoting better combustion and lower emissions. However, this addition dramatically shortens the shelf life of gasoline and increases its tendency to absorb water. If you’ve ever had your car start running rough in the winter and had to use a product called “Drygas” (Isopropyl alcohol) you’ve been a victim of this phenomenon. I’m all for alternative fuel research, and I’m not about to get into a debate on ethanol in gas vs no ethanol in gas. I will show you how to increase the shelf life of your fuel and make life easier for your gas operated power equipment in the winter months. Similar to the diesel additive I mentioned before, you can put an additive in your gasoline that will stabilize it against water absorbtion, and slow down the rate at which the gasoline will oxidize (polymerize/turn to goo). All you have to do is add the amount recommended by the manufacturer to an empty can before you fill it up. If you think you already have water in your gasoline, you’ll need a “Drygas” product or some 99% Isopropyl Alcohol. Add the IPA to your tank at a ratio of .5oz per gallon of gas. On top of the additives, you should get a cheap measuring cup and funnel. These can be had for about a dollar each. Now get out there and do some work! This entry was posted in Tools/Equipment and tagged car, diesel, fuel, gas, gasoline, Kubota, maintenance, Tractor, truck, winter. Bookmark the permalink.